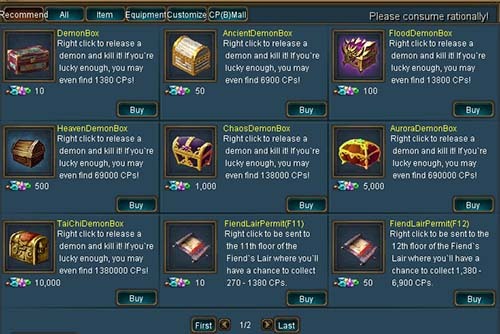 Visit Fiend Lair Shop (Twin City 340,428) to purchase Demon Boxes and Fiend Lair Permit F11-F18. Open the boxes to release the demons and use the permits to enter the Fiend Lairs. Kill the demons and monsters to win awesome rewards. Right click to release a demon and kill it! If you`re lucky enough, you may even find 1380 CPs! Right click to release a demon and kill it! If you`re lucky enough, you may even find 6900 CPs! Right click to release a demon and kill it! If you`re lucky enough, you may even find 13800 CPs! Right click to release a demon and kill it! If you`re lucky enough, you may even find 69000 CPs! Right click to release a demon and kill it! If you`re lucky enough, you may even find 138000 CPs! Right click to release a demon and kill it! If you`re lucky enough, you may even find 276000 CPs! Right click to release a demon and kill it! If you`re lucky enough, you may even find 690000 CPs! Right click to release a demon and kill it! If you`re lucky enough, you may even find 1380000 CPs! 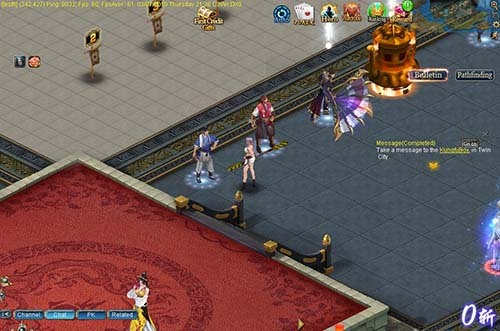 Right click to be sent to the 11th floor of the Fiend`s Lair where you`ll have a chance to collect 270 - 1380 CPs. Right click to be sent to the 12th floor of the Fiend`s Lair where you`ll have a chance to collect 1,380 - 6,900 CPs. Right click to be sent to the 13th floor of the Fiend`s Lair where you`ll have a chance to collect 2,700 - 13,800 CPs. Right click to be sent to the 14th floor of the Fiend`s Lair where you`ll have a chance to collect 5,400 - 27,600 CPs. Right click to be sent to the 15th floor of the Fiend`s Lair where you`ll have a chance to collect 13,500 - 69,000 CPs. Right click to be sent to the 16th floor of the Fiend`s Lair where you`ll have a chance to collect 27,000 - 138,000 CPs. Right click to be sent to the 17th floor of the Fiend`s Lair where you`ll have a chance to collect 54,000 - 276,000 CPs. Right click to be sent to the 18th floor of the Fiend`s Lair where you`ll have a chance to collect 135,000 - 690,000 CPs.